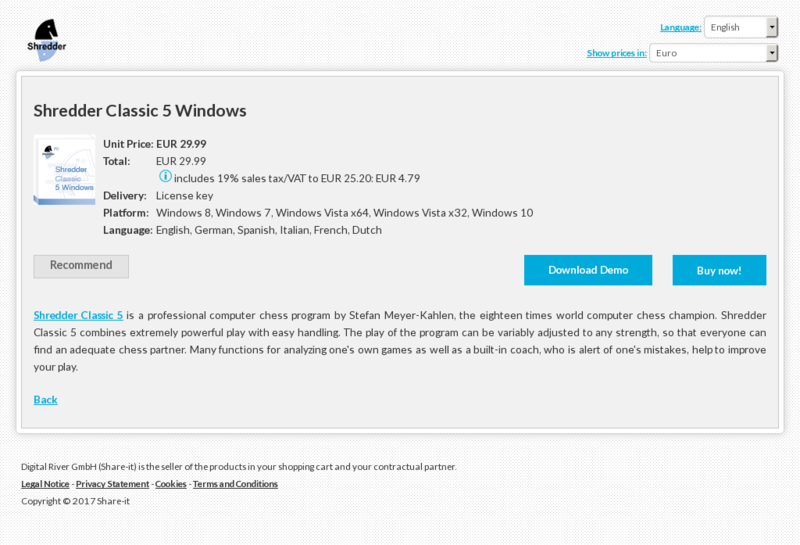 Shredder Classic 5 is a professional computer chess program by Stefan Meyer-Kahlen, the eighteen times world computer chess champion. Shredder Classic 5 combines extremely powerful play with easy handling. The play of the program can be variably adjusted to any strength, so that everyone can find an adequate chess partner. Many functions for analyzing one’s own games as well as a built-in coach, who is alert of one’s mistakes, help to improve your play. 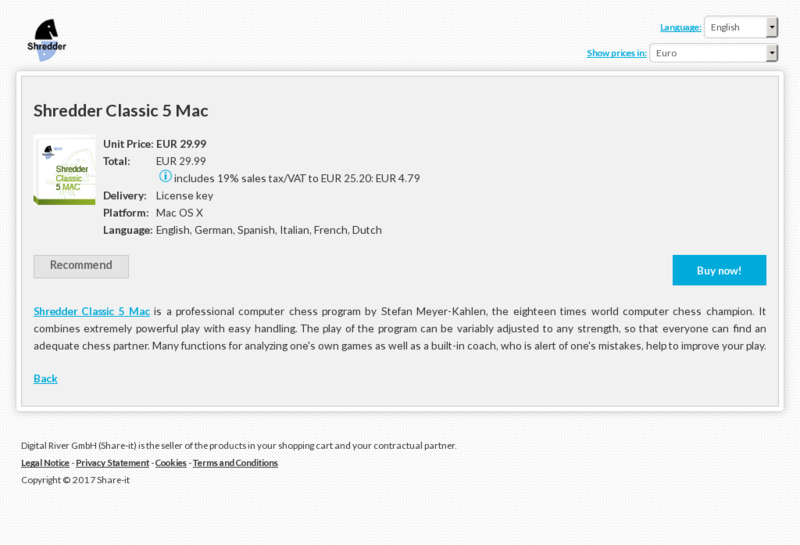 Shredder Classic 5 Mac is a professional computer chess program by Stefan Meyer-Kahlen, the eighteen times world computer chess champion. It combines extremely powerful play with easy handling. The play of the program can be variably adjusted to any strength, so that everyone can find an adequate chess partner. Many functions for analyzing one’s own games as well as a built-in coach, who is alert of one’s mistakes, help to improve your play. Shredder 13 Windows is a professional computer chess program by Stefan Meyer-Kahlen, the eighteen times world computer chess champion. Shredder 13 combines extremely powerful play with easy handling. The play of the program can be variably adjusted to any strength, so that everyone can find an adequate chess partner. Many functions for analysing one’s own games as well as a built-in coach, who is alert of one’s mistakes, help to improve your play. 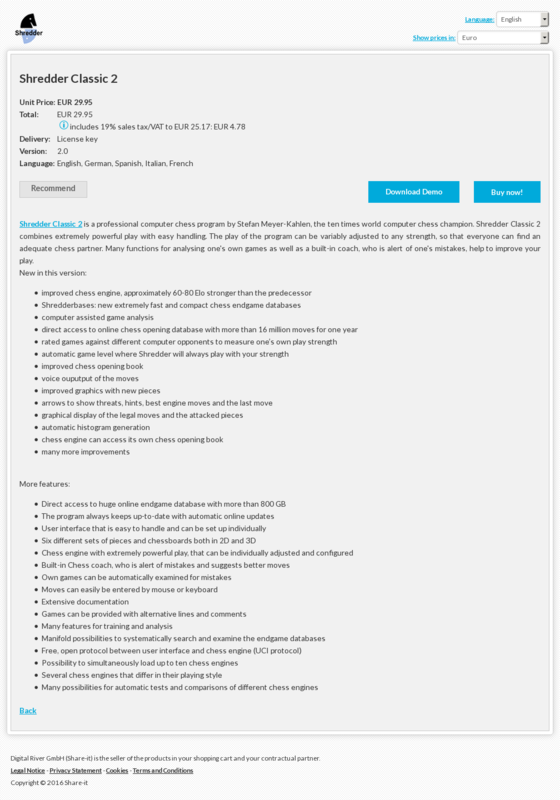 Shredder 13 is the latest and strongest version of the Shredder family, a series of the best and most successful chess programs in the last years. Shredder 13 Linux is a professional computer chess program by Stefan Meyer-Kahlen, the eighteen times world computer chess champion. It combines extremely powerful play with easy handling. The play of the program can be variably adjusted to any strength, so that everyone can find an adequate chess partner. Many functions for analyzing one’s own games as well as a built-in coach, who is alert of one’s mistakes, help to improve your play. Deep Shredder 13 Windows is a professional computer chess program by Stefan Meyer-Kahlen, the eighteen times world computer chess champion. Deep Shredder 13 combines extremely powerful play with easy handling. The play of the program can be variably adjusted to any strength, so that everyone can find an adequate chess partner. Many functions for analyzing one’s own games as well as a built-in coach, who is alert of one’s mistakes, help to improve your play. Deep Shredder 13 is the latest and strongest version of the Shredder family, a series of the best and most successful chess programs in the last years. It can use more than one CPU simultaneously on multi CPU systems to get an extra performance boost. Deep Shredder 13 Mac is a professional computer chess program by Stefan Meyer-Kahlen, the eighteen times world computer chess champion. It combines extremely powerful play with easy handling. The play of the program can be variably adjusted to any strength, so that everyone can find an adequate chess partner. Many functions for analyzing one’s own games as well as a built-in coach, who is alert of one’s mistakes, help to improve your play. 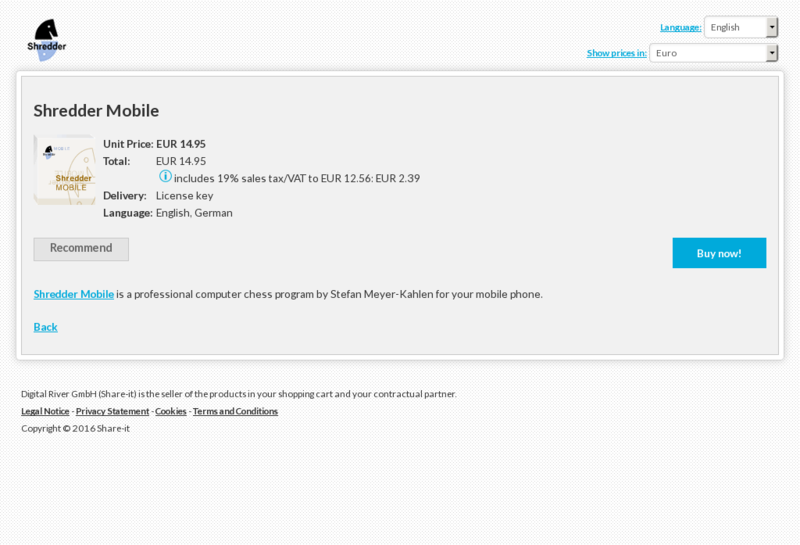 Shredder Mobile is a professional computer chess program by Stefan Meyer-Kahlen for your mobile phone. Shredder Classic Mac is a professional computer chess program by Stefan Meyer-Kahlen, the ten times world computer chess champion. It combines extremely powerful play with easy handling. The play of the program can be variably adjusted to any strength, so that everyone can find an adequate chess partner. Many functions for analysing one’s own games as well as a built-in coach, who is alert of one’s mistakes, help to improve your play. Shredder Classic 4 Linux is a professional computer chess program by Stefan Meyer-Kahlen, the twelve times world computer chess champion. It combines extremely powerful play with easy handling. The play of the program can be variably adjusted to any strength, so that everyone can find an adequate chess partner. Many functions for analysing one’s own games as well as a built-in coach, who is alert of one’s mistakes, help to improve your play. 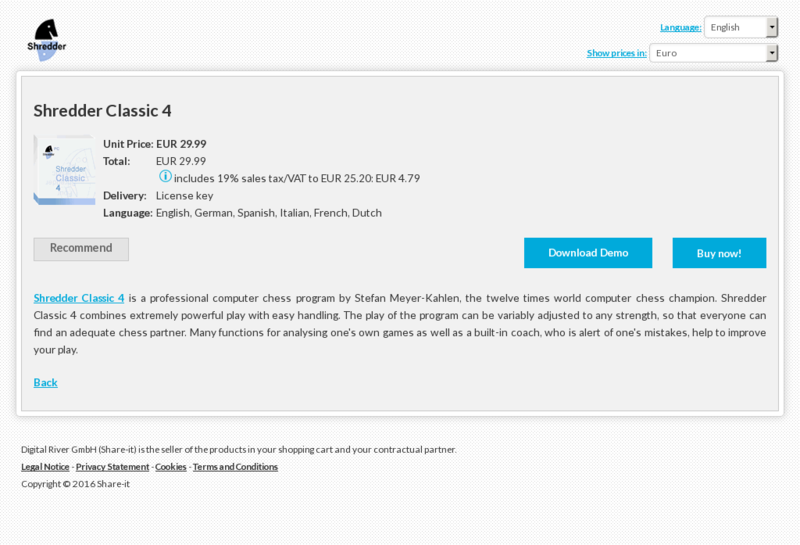 Shredder Classic 4 is a professional computer chess program by Stefan Meyer-Kahlen, the twelve times world computer chess champion. Shredder Classic 4 combines extremely powerful play with easy handling. The play of the program can be variably adjusted to any strength, so that everyone can find an adequate chess partner. Many functions for analysing one’s own games as well as a built-in coach, who is alert of one’s mistakes, help to improve your play. 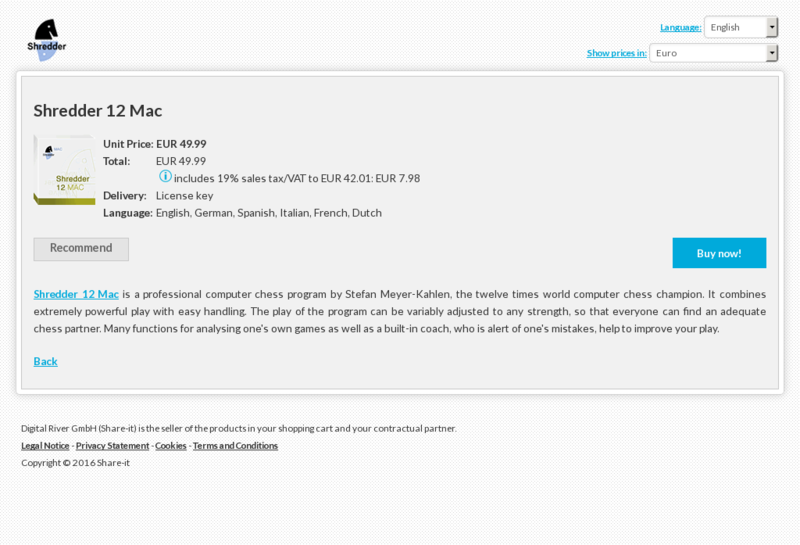 Shredder Classic 3 Mac is a professional computer chess program by Stefan Meyer-Kahlen, the twelve times world computer chess champion. It combines extremely powerful play with easy handling. The play of the program can be variably adjusted to any strength, so that everyone can find an adequate chess partner. Many functions for analysing one’s own games as well as a built-in coach, who is alert of one’s mistakes, help to improve your play. 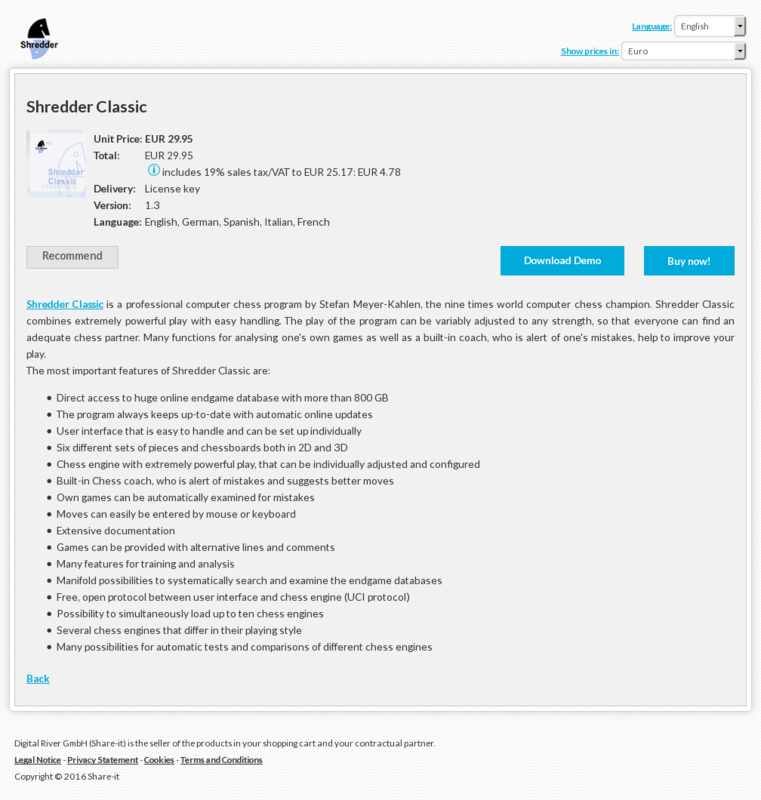 Shredder Classic 3 Linux is a professional computer chess program by Stefan Meyer-Kahlen, the twelve times world computer chess champion. It combines extremely powerful play with easy handling. The play of the program can be variably adjusted to any strength, so that everyone can find an adequate chess partner. Many functions for analysing one’s own games as well as a built-in coach, who is alert of one’s mistakes, help to improve your play. Shredder Classic 2 is a professional computer chess program by Stefan Meyer-Kahlen, the ten times world computer chess champion. Shredder Classic 2 combines extremely powerful play with easy handling. The play of the program can be variably adjusted to any strength, so that everyone can find an adequate chess partner. Many functions for analysing one’s own games as well as a built-in coach, who is alert of one’s mistakes, help to improve your play. Shredder Classic is a professional computer chess program by Stefan Meyer-Kahlen, the nine times world computer chess champion. Shredder Classic combines extremely powerful play with easy handling. The play of the program can be variably adjusted to any strength, so that everyone can find an adequate chess partner. Many functions for analysing one’s own games as well as a built-in coach, who is alert of one’s mistakes, help to improve your play. Shredder 9 UCI is a professional computer chess program by Stefan Meyer-Kahlen, the nine times world computer chess champion. Shredder 9 UCI combines extremely powerful play with easy handling. The play of the program can be variably adjusted to any strength, so that everyone can find an adequate chess partner. Many functions for analysing one’s own games as well as a built-in coach, who is alert of one’s mistakes, help to improve your play. Shredder 9 UCI is the latest and strongest version of the Shredder family, a series of the best and most successful chess programs in the last years. 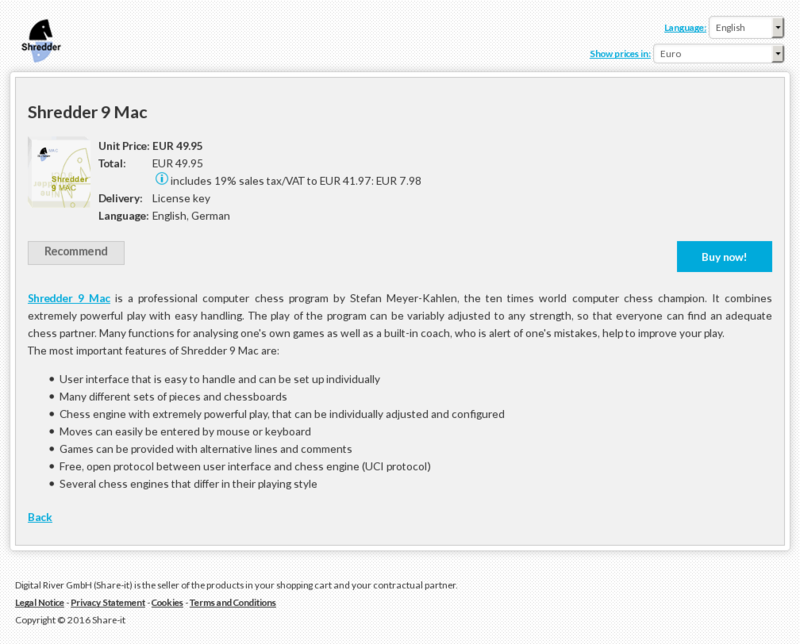 Shredder 9 Mac is a professional computer chess program by Stefan Meyer-Kahlen, the ten times world computer chess champion. It combines extremely powerful play with easy handling. The play of the program can be variably adjusted to any strength, so that everyone can find an adequate chess partner. Many functions for analysing one’s own games as well as a built-in coach, who is alert of one’s mistakes, help to improve your play. Shredder 9 Linux is a professional computer chess program by Stefan Meyer-Kahlen, the ten times world computer chess champion. It combines extremely powerful play with easy handling. The play of the program can be variably adjusted to any strength, so that everyone can find an adequate chess partner. Many functions for analysing one’s own games as well as a built-in coach, who is alert of one’s mistakes, help to improve your play. Shredder 12 UCI is a professional computer chess program by Stefan Meyer-Kahlen, the twelve times world computer chess champion. Shredder 12 UCI combines extremely powerful play with easy handling. The play of the program can be variably adjusted to any strength, so that everyone can find an adequate chess partner. Many functions for analysing one’s own games as well as a built-in coach, who is alert of one’s mistakes, help to improve your play. Shredder 12 UCI is the latest and strongest version of the Shredder family, a series of the best and most successful chess programs in the last years. Shredder 12 Mac is a professional computer chess program by Stefan Meyer-Kahlen, the twelve times world computer chess champion. It combines extremely powerful play with easy handling. The play of the program can be variably adjusted to any strength, so that everyone can find an adequate chess partner. Many functions for analysing one’s own games as well as a built-in coach, who is alert of one’s mistakes, help to improve your play. Shredder 12 Linux is a professional computer chess program by Stefan Meyer-Kahlen, the twelve times world computer chess champion. It combines extremely powerful play with easy handling. The play of the program can be variably adjusted to any strength, so that everyone can find an adequate chess partner. Many functions for analysing one’s own games as well as a built-in coach, who is alert of one’s mistakes, help to improve your play.